I think that education is very important for everyone. Everybody should be at least basically educated. If the people are good educated they can get a good, well-paid job. If someone has only basic education, he or she usually can’t get as good job as more educated people but if he is clever and has a little luck he could became a millionaire too. People with high school mostly think that they must have the best jobs and the most money. Situation is a little bit more complicated. There are not enough jobs neither for less educated nor for high educated. High educated also would like to earn a lot of money from the beginning, but it’s not possible. People with low education usually work as cleaning women or workers. These jobs are also important but they are not very well paid. There are some problems with illiterate people in some countries – they can’t read and write and they don’t want to work. They became homeless or criminals and they causes a lot of problems. Pre-school education begins at the age of 3. Children can attend kindergartens. They play together there, sing, draw and learn basic thinks like how to tie their bootlaces or that washing their hands before lunch is very important, etc. Some children about 1, whose mothers can‘t stay with them on maternity leave, have to attend creche. Creche are only in cities. Primary education starts at basic schools, lasts 9 years and has 2 degrees (low and high). Children start basic school at 6 and leave at the age of 14 or 15. Basic schools are compulsory for all children. They learn writing, reading, counting, Czech language, from 5th class also biology, geography, foreign language, physics, etc. Everyone can choose the secondary education, which lasts usually 4 years. Children in 9th class can send their applications or admission to grammar school (these schools don‘t have any specialisation, students learn everything), there can be grammar schools for 6,7,8 or 9 years, to secondary special schools (like technical schools, economical, agriculture, music, for health workers, languages…), or they can also choose vocational schools = apprentice sch. which prepare young people for practical professions (shop assistant, cook, waiter, carpenter, bricklayer, painter, locksmith…). Students finish their secondary education after passing the school leaving exams. In our school we have to pass the exam in Czech and one foreign language and we can choose two subjects more. After passing the school leaving exams, students can attend universities or colleges. They can study economics, art, medicine, computers, geography, languages, philosophy, law… This study lasts 5 or 6 years and each year has consists of two terms. They finish it with defence of their thesis (diplomová práce). They can study more faculties together. Children in GB can attend nursery schools or kindergartens since they are 3 years old. They learn basic things like in our country. Then they decide whether they want to continue or not. If so, they study 2 or 3 years and then, at the age of 18, they sit for A-level exams. They take it in 3 or 4 subjects. Then they have open doors to universities. There are about 47 universities in GB. The most known are Oxford and Cambridge, where is a typical tutorial system (each student has it’s own teacher, who helps him). University usually lasts 3 or 4 years (5 or 6 in medicine, dentistry and veterinary sciences). Students can get a degree of bachelor and they could study to get a degree of master. In Britain students are supposed to wear uniforms. We can find the main reason in the past. There were students from different families, some were rich some poor and when they wore uniforms teachers couldn’t recognize it. There are about 13 classes in our school, with about 300 students. Upon on entering the school we are in student’s cloakrooms. There is also school canteen and typing lab in this part of school. On the ground floor we can find the classrooms, language lab, two computer labs, small shop, music lab and teacher’s studies. There is one room more occupied by school servant. On the first floor there are classrooms, English lab, German lab, biology lab headmaster’s office and teacher’s studies. There is also one very interesting room with a copier. On the second floor we can, except classrooms and teacher’s studies, find physics and chemistry lab, and school library. On the wall on the first floor students have the notice board where they can find some important information. The walls in the corridors are behung (ověšeny) with many pictures, photos, etc. The oldest students have important information about universities on the ground floor. Our school has some new equipment like videos, TV, cassette players, overhead projectors, In computer laboratories there are about 20 computers. In every teacher’s study there is also one computer. Every computer is connected into our local network. The school has entrance to Internet, but it’s just for teachers. The school has also a gym. It’s very small, but it doesn’t matter because there is a big hall next to the school. Behind the school there are two volleyball courts and a football field. The teacher comes to the classroom and all students stand up – it’s the greeting to the teacher. Then the teacher says, “Sit down” and writes to the class register who is missing. Then he starts to teach. Some teachers like to examine to found whether students study hard or not. I really don’t know why they practice in. It’s unpleasant for both sides I think. Time to time students have to write a short test not longer then 45 minutes. The ring reports the beginning and the end of the lesson. Brakes have usually 10 minutes just two of them have 15 I thing. I thing it’s quite hard for children in our republic who are 14 or 15 to choose their secondary school. Some of them know what they want to do as their job but the most of them don’t know it. The same problem has students at secondary schools. They have to decide but they often say to themselves that it was bad decision. I know it from my own experience. I didn’t attend creche but I used to attend kindergarten for two years. Then I visited the primary school in Hlučín and at the age of 12 I passed an entrance exams to grammar school. Now I’ve been studying here for 6 years. I used to do a lot of extra school activities. I attend extra English lessons, computers, programming; we used to play florball last year. I still attend some of them: basketball, volleyball. There are a lot of other clubs in this school like chorus or typing, but I am not a member. My favourite subject is PE. I used to like physics at primary school but I hate it now, but I am going to do the entrance exams in it. I also like computers. I think this school is quite good, the quality is also said to be high, I thing the equipment could be better – in the gym, there is equipment just for a few sports, the computers are a little bit old, and there is not an entrance to Internet for students. It is good that a new class is equipped nearly every year. I like that the school takes part in some competitions in sport or education and that still keeps some traditions like NON-STOP etc. I would like to study at university. I’ll probably study geography or something technically bent. I love traveling, planning ways, comparing different countries. I wanted to study computers but I found that I’m not very good at it. I work a lot with computer at home and I also read a lot about it but probably it’s not enough. I wanted to study languages, because everyone said to me that I will need it, but I left this idea because nearly every young student can speak English and German today. I would have to learn Chinese or Japanese but it would be too tough for me. But it could be interesting. I am a little bit influenced by my father because he studied physics at VUT in Brno. I also want to improve my foreign languages at university and I’d like to learn Russian. This language fascinates me. The speaking sounds so fun that it’s great. Then I’d like to work somewhere with people. I don’t want to work in an office and work with papers. Maybe I’ll try to travel somewhere. Found new countries just to have holiday but I’ll have to save a lot of money before I‘ll do that. 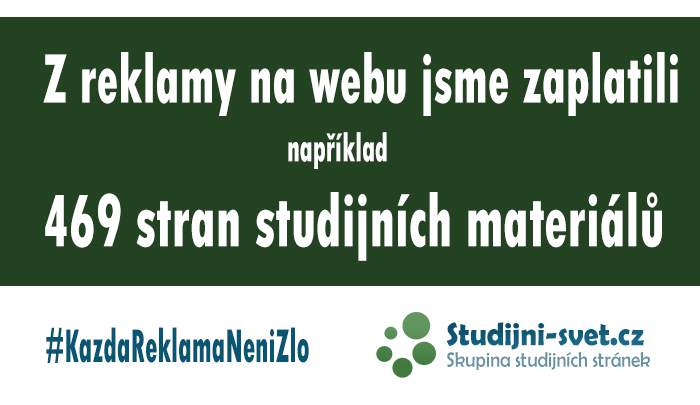 optional subjects – volitelné př.